Volunteers of America Mid-States has been accredited by the Council on Accreditation (COA), a designation designed to identify providers that have set high performance standards and a commitment to deliver the highest quality services. 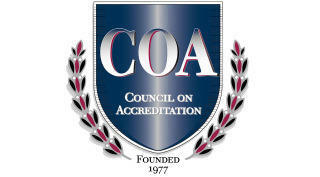 COA accreditation is an objective and reliable verification that provides confidence and support to an organization’s service recipients, board members, staff, and community partners. The COA accreditation process involves a detailed review and analysis of both an organization’s administrative operations and its service delivery practices. All are measured against national standards of best practice. These standards emphasize services that are accessible, appropriate, culturally responsive, evidence based, and outcomes-oriented, In addition, they confirm that the services are provided by a skilled and supported workforce and that all individuals are treated with dignity and respect. Volunteers of America Mid-States conducts a vigorous review process to measure our performance in an effort to continually improve our organization. Volunteers of America Mid-States originally sought and received COA accreditation in 2011, and was reaccredited in 2015.